There are 24 new entrants in this year’s Influence 100, due to factors including job changes (several of last year’s influencers have left their roles) and the rise of various executives, companies, industries and regions. Unsurprisingly, the influence of North America has continued to rise, with 58 influencers from this region (up from 56 last year). 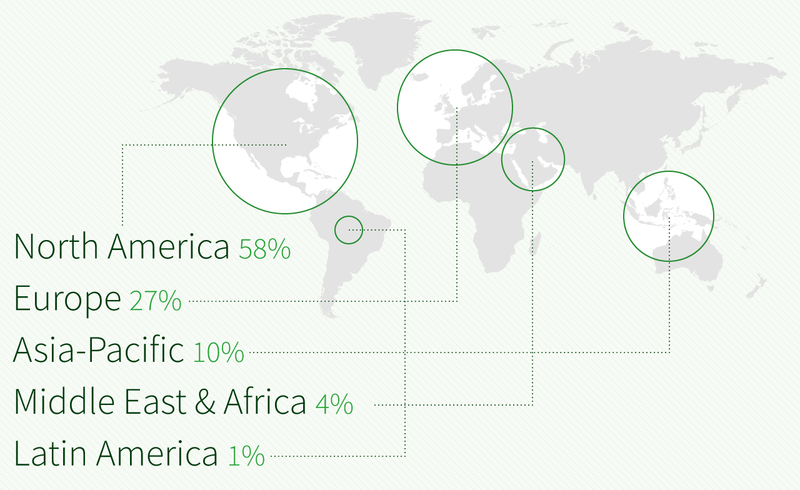 Meanwhile, 31% come from EMEA, 10% from Asia-Pacific and only 1% from Latin America this year. 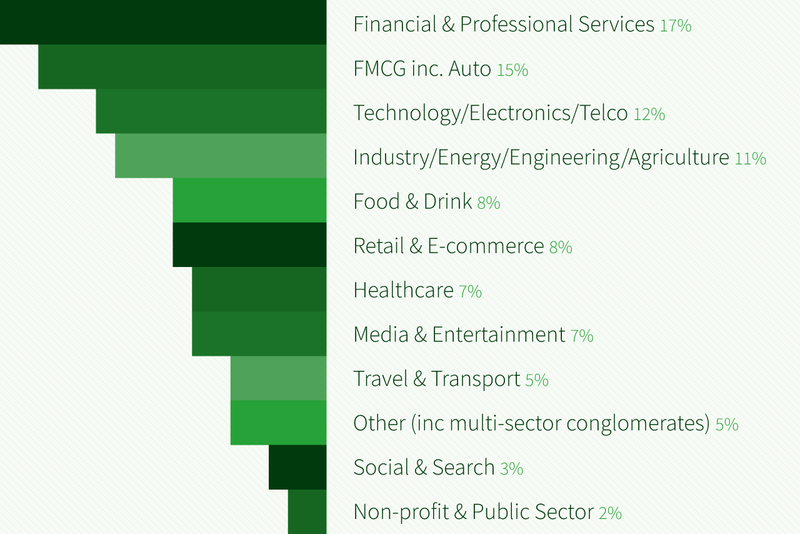 With practically every company now a technology company to a greater or lesser extent, breaking down the Influence 100 by sector has become increasingly complex. So this year we’ve refreshed all our categories to focus on what the organisations our influencers work for actually do or sell, not how they do it or whether their audience is consumer or B2B. So Amazon is a retailer, Uber is a transport firm, and Paypal is a financial services company. We’ve introduced new categories to split out mainly consumer-facing brands, including putting FMCG and automotive together, separating out food and drink, and media and entertainment, and adding a new ‘social and search ‘category rather than lumping Google, Facebook and LinkedIn in with technology. Meanwhile, the technology category has gone old-school: traditional hardware and software companies, plus electronics and telecoms. The number of women on the list is again 38%, up from 33% in 2015 but still a long way from gender balance at the top of the global CCO/CMO cohort. The women who join the ranks of the Influence 100 this year are: Deborah Yeh, SVP marketing and brand at Sephora; Dustee Tucker Jenkins, Spotify’s global head of communications and PR; Yum! Brands global chief communications officer Jerilan Greene; Jill Hazelbaker, Uber’s SVP, communications and public policy; Kaisa Lipponen, director of corporate communications and brand Marketing at Neste; Bacardi’s global chief communications officer KC Kavanagh; Mattel vice president, global marketing communications Kristina Duncan; Michelle Russo, EVP global communications at Discovery; Facebook’s VP communications Rachel Whetstone and Valerie Tan, Emirates’ VP public relations, social media and internal communications. Our Influence 100 communicators and marketers have worked for their current company for an average of 9.3 years, around the same as last year’s average tenure of 9 years. This was despite several high-profile job changes for long-standing employees, such as Ray Day moving to the CCO role at IBM after 19 years at Ford. Two of our influencers – L’Oreal’s EVP corporate communications & external affairs Beatrice Dautresme, and Saudi Aramco VP corporate affairs Nasser Al Nafisee – have been with their respective companies for an astonishing 47 years each. Other long-serving influencers include P&G chief brand officer Marc Pritchard (37 years) and Michael Sneed, J&J’s worldwide VP, global corporate affairs & chief communication officer (35 years). There’s a fair split between long-stayers and fresh players in the listing: 13% of the cohort have been with their employer for 20 years or more, and the same proportion have been with their current company for less than two years. Was communications your first career? If not, what was your first career? Nearly all our Influence 100 are educated to at least first degree level, although a small number have proved that it’s still possible to get to the top without a college or university education. Of this year’s cohort, 61% are educated to first degree level, and 37% also have an advanced degree (down from last year when 51% said they had an advanced degree). In terms of the most popular subjects for study, there was an unsurprisingly clear bias towards communications, journalism, English and literature. There were also multiple responses for management and business, economics, political science and politics, and history. Drama, psychology, law and sociology were more niche subjects for those who end up at the top of the communications and marketing tree. As last year, most respondents (59%) said PR was their first career — a notable contrast to 2015 when almost the same number of the respondents said PR was not their first career. Predictably, journalism and politics were the most common previous careers. There were, however, some more unexpected responses, including a stint in the military, teaching and law. Nearly 65% of the respondents have spent time in agencies during their career; among those, most (41%) spent between five and ten years working agency-side.